Technology makes our lives easier, but it could also be cutting our lives short. 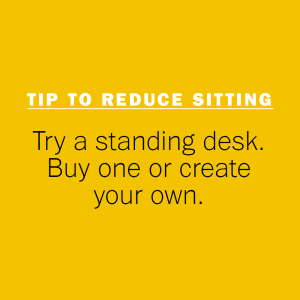 Find out why sitting makes you a sitting duck for disease. Human ingenuity has made our lives more convenient than ever before. Instead of getting up and walking down the passage to ask your colleague a question, you can just pop her an e-mail and get a response without leaving your desk. And with online shopping you don’t have to trudge through busy malls or stand in long queues to buy groceries – from the comfort of your sofa you can order and pay for everything using your cellphone or tablet. Technology offers a lot of convenience, and ideally we should use the time it saves us to go outside and be active. But instead, we spend it behind the computer, either doing more work, surfing the internet or checking Facebook, or we plop down in front of the TV to watch a mini-series or play games on the Xbox. Our lifestyles have become so passive that doctors are now referring to our inactivity as ‘sitting disease’. Although not an actual sickness, sitting disease is a lifestyle pattern that can lead to a whole range of conditions such as obesity, diabetes, heart disease and cancer, which can eventually shorten your lifespan. 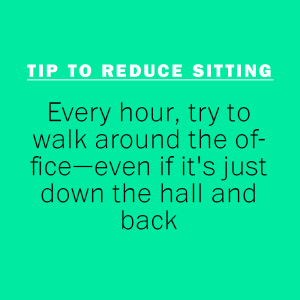 Passive sitting burns far fewer kilojoules than walking or even just standing, which means you’re more likely to pile on weight if you sit constantly for long periods of time. Being overweight or obese is the precursor of many diseases, including type 2 diabetes and certain cancers. 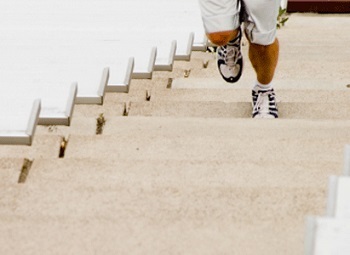 It is well known that exercise gives the brain a boost, not just by improving your memory, but also improving your mood through the endorphins it releases. Unfortunately, long hours of sitting can do the opposite. It can make you forgetful and no exercise means no feel-good hormones get to the brain. Too much sitting can lead to sleep apnoea (a condition whereby you temporarily have difficulty breathing or stop breathing) which interferes with your quality of sleep and can leave you feeling tired and lethargic. After a day of sitting, your lower back, hamstrings, and hip flexor muscles are tightened.